North Korean leader Kim Jong-il’s eldest son Jong-nam said he was opposed to his country’s third-generation hereditary succession in a rare interview with a Japanese broadcaster. “Personally, I am against the third-generation succession,” Jong-nam said in Korean in an interview by TV Asahi aired Tuesday. The interview was conducted in Beijing last Saturday, a day before the 65th founding anniversary of the North Korean Workers’ Party, when Jong-un appeared next to his father as they watched a military parade. Despite being the eldest son of Kim Jong-il, Jong-nam was squeezed out of the competition to become the country’s next leader. He reportedly grew out of his father’s favor after being caught trying to enter Japan with a fake passport to visit Tokyo Disneyland in 2001. Jong-nam said he was willing to help Jong-un anytime overseas. Jong-nam said it was difficult to comment on his father’s health. Jong-nam, who has lived in Macau and China for several years, referred to his country as “North Korea,” instead of “North Joseon” or “the republic,” which other North Koreans use. Jong-nam was born in 1971 to Kim Jong-il and former actress Song Hye-rim, who died in 2002. Half brother Jong-un was born in 1984 to dancer Koh Young-hui, who died abroad, most likely in Russia, in 2004. 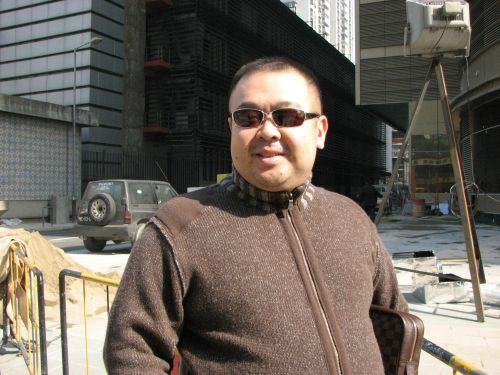 It is estimated that Jong-nam spends at least $500,000 annually for his three wives and concubine as well as their children who go to international schools in Macau and Beijing. The jobless prince used to have “sponsors” within the North Korean power elite, but now depends on “allowances” from his father. North Korea watchers here said Jong-nam appeared to have had both his survival and the outside view of his country in mind in the interview with TV Asahi. “He basically said he is against the third-generation succession but not against Kim Jong-un,” said Yang Moo-jin, professor at the University of North Korean Studies. The eldest son showed to the world that he was alive and well abroad after Jong-un was named successor despite speculations of a power struggle between the brothers, Yang said. Jong-nam seems to have made it clear that he will not return to North Korea by saying that he was against the third generation succession, according to Kim Yong-hyun, professor of North Korean studies at Dongguk University. “He drew a line on his position that he would not interfere with the North Korean power elite,” Kim said. Jong-nam is likely to continue living outside North Korea, following the examples of his uncle and great uncle. The power transfer from North Korea’s founder Kim Il-sung, who died in 1994, to his son Kim Jong-il, which came after 20 years of grooming, left his former rivals living far away from home for decades. Kim Jong-il’s half-brother Pyong-il has lived abroad since 1988, starting with his post as North Korean ambassador to Hungary and Bulgaria. He was appointed ambassador to Finland in 1994 and has been ambassador to Poland for 12 years since 1998. Kim Jong-il’s uncle and former political archrival Kim Young-ju had to live in the northwestern province of Jagang-do from the mid-1970s through the early 1990s.